The C-1 Condenser Microphone is one of Behringer's affordable recording mics for studio and live performance. It features a large 16mm diaphragm condenser transducer, which provides high audio quality. The microphone is equipped with ultra-low noise, transformerless FET input that eliminates low-frequency distortion. To get the highest signal integrity, Behringer equipped the C-1 with gold-plated 3-pin XLR output connector. FEEDBACK REMOVAL - The Behringer C-2 Matched Pair features cardioid pickup pattern that effectively CAPTURES EVERY NUANCE IN YOUR VOCAL/ACOUSTIC RECORDING - The Behringer C-1 microphone features 16mm condenser transducer, which provides a wider and flatter frequency response. It captures more sonic details than most dynamic mics. REJECTS UNNECESSARY NOISE - Sounds coming in front of the mic is strongly picked up thanks to C-1's cardioid pickup pattern. The cardioid polar pattern rejects off-axis sounds and prevents unwanted noise from ruining your recording. ELIMINATES DISTORTION - This microphone is equipped with low noise, transformerless Field-Effect Transistor (FET) input that blocks low-frequency distortion. PROVIDES DURABILITY - The C-1 mic is equipped with gold-plated 3-pin XLR output connector, which offers the highest signal integrity. Its gold-plating ensure the microphone won't quickly corrode. INCLUDES - Behringer C-1 Large-Diaphragm Condenser Microphone. 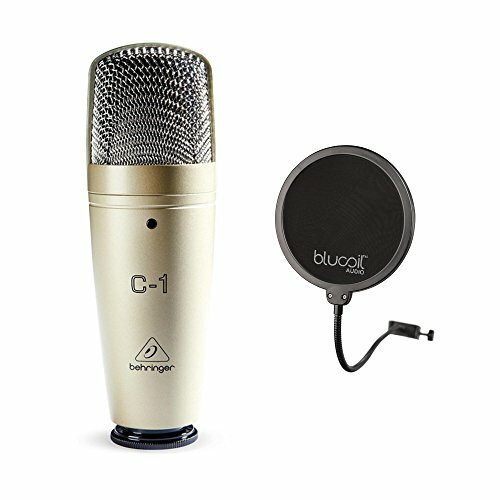 Blucoil Audio Microphone Pop Filter Double Layer Mask Shield for Studio Recording and Broadcasting with Stand Clip Stabilization Arm, Swivel Mount.